Civic Center Residents Coalition NYC: Congresswoman Nydia Valazquez issues a letter of opposition to the Terror Trials in NYC !!! 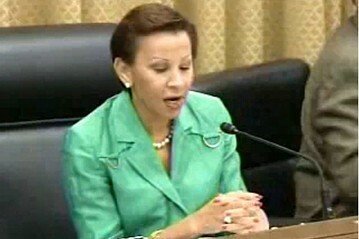 Congresswoman Nydia Valazquez issues a letter of opposition to the Terror Trials in NYC !!! Washington, DC – U.S. Representative Nydia M. Velázquez (D-NY) has sent the following letter to U.S. Attorney General Eric Holder calling on him to reconsider holding the trials for Khalid Sheikh Mohammed and other terrorist defendants in Lower Manhattan’s federal courthouse. As you know, the U.S. Department of Justice (DOJ) recently proposed trying Khalid Sheikh Mohammed and several other co-defendants in the federal courthouse in Lower Manhattan. I am alarmed by the current proposal and its potential impact on the daily lives of neighborhood residents, as well as commercial activity, in an area that has already been subjected to enhanced security since 9/11. I implore you to reconsider trying these high profile terrorists in Lower Manhattan. Considering the implications that a Lower Manhattan trial would have on the lives of residents and the health of businesses in the neighborhood, I do not believe that the needs of this community have been properly taken into account. Community Board 1 recently held a public hearing with more than 100 residents participating to voice their displeasure with the negative impact this would have on there lives. The current plan would create a fortress-like perimeter around the courthouse. Within this security zone lie two large residential buildings – Chatham Towers, a 240-unit building, and Chatham Green, with more than 400 units. For the length of the trial, life for the thousands of residents living in these two developments would be severely disrupted. Their homes would be surrounded by metal barriers, vehicle access would be restricted, and a visible security presence would be felt by them continuously. An untenable living situation would be imposed on these residents for several years without their consultation. In addition, an increased police presence with random stops and searches, along with exacerbated traffic congestion, will deter many visitors from shopping in the area. Such changes would have a profoundly negative impact on the fourth-largest business district in the country and it seems that the plan is being imposed without any economic analysis of what could be done to mitigate the impact on the community or the cost to local small businesses. It should be noted that these businesses, which employ tens of thousands of people and are critical to the city’s economic vitality, have already suffered from restricted parking and access under current security plans. In conclusion, I believe the choice for a trial location has been made in an extremely shortsighted manner and I would respectfully request that you explore the possibilities of moving the trial to an alternate site. To begin correcting these problems, the Department of Justice must make itself available immediately to discuss the negative effects this trial will have on Lower Manhattan and to hear firsthand the community’s concerns. This will ensure the public’s input is fairly considered during this process and that all potentially negative impacts of the trial’s location are thoroughly evaluated. I look forward to hearing from you and appreciate your attention to this important matter.